(Nanowerk News) In the middle of the large Chilean Atacama desert, a team of Polish astronomers are patiently monitoring millions of celestial bodies night after night with the help of a modern robotic telescope. In 2013, the team was surprised when they discovered, in the course of their survey, stars that pulsated much faster than expected. In the following years, the team that included Dr. Marilyn Latour, an astronomer from the Dr. Remeis-Sternwarte Bamberg, the astronomical institute of Friedrich-Alexander-Universität Erlangen-Nürnberg (FAU), studied these stars in more detail and concluded that they had stumbled upon a new class of variable star (Nature Astronomy, "Blue large-amplitude pulsators as a new class of variable stars"). 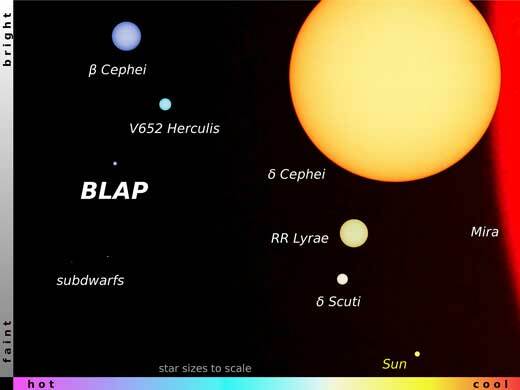 In order to find out whether BLAPs are actually hot dwarfs, the astronomers used two of their largest telescopes to make observations. They were able to capture suitable spectra of some BLAPs using the large Gemini and Magellan telescopes, both located in the Chilean Atacama desert. Latour analysed these spectra using sophisticated physical-numerical models. She was able to show that the variations in luminosity are attributable to temperature changes on the surface of the stars. The temperature of the BLAPs turned out to be five times greater than that of the Sun - something that is characteristic of hot dwarfs.